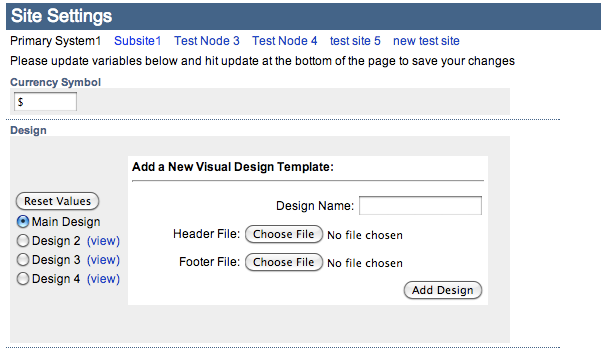 One of the great advantages of Community Enterprise for clients and designers is the flexible way it handles visual design templates. That is, CE can easily incorporate a wide variety of visual designs without compromising the integrity of the underlying system or easy upgradeability to new releases. This is a contrast to many comparable commercial and open source software platforms which are either overly restrictive of visual design in order to retain upgradeability or have to be customized or "forked" in order to incorporate design templates (which compromises upgradeability). This is good for clients because they don't have to sacrifice great design to have system stability and upgradeability and because they can work with any designer they like. And, this is good for designers because they can easily partner with CitySoft and know that their designs will work in CE and that their clients will be happy. Easily turn on or off visual design-related components like different navigation schemes, site search, breadcrumbs, logins and more. There are many great examples of widely diverse visual designs that have been easily integrated into Community Enterprise. A few examples are included below.